The Hanging Gardens of Babylon went down in history as one of the Seven Wonders of the World. Vertical gardens were then, as they still are today, signs of innovative architecture. In nature, plants seem to thrive in the most inhospitable places: alpine flowers grow in crevices; ferns, moss and lichen colonise the edges of waterfalls. Algae even grows where there's no oxygen... But to exist, plants rely on a complex eco-system. Adding planting to architectural elements always presents the problem of how to provide the plants with the right amount of nutrients, light and water. Here, Architonic presents some planting systems, which are low-maintenance, aesthetic and durable. 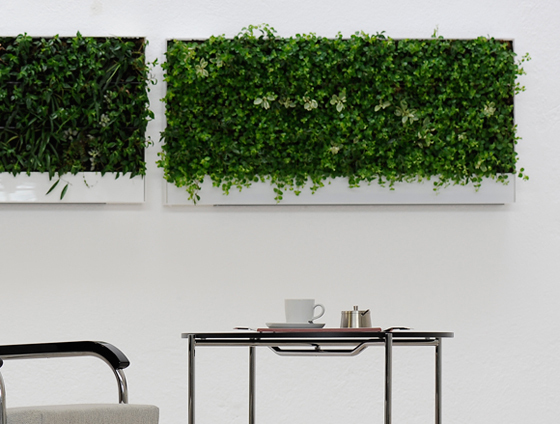 Artaqua has developed the 'Grüne Wand®' system, which won the 2003 German Award for Innovation. 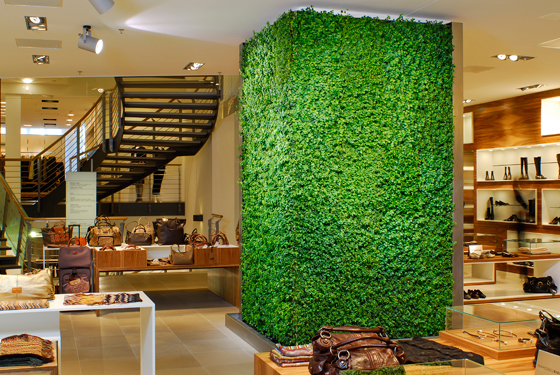 The 'Grüne Wand®' consists of a high-grade-steel internal structure with substrate panels. The planting is put into them before installation and is cultivated in a nursery. Because the substrate panels are made of antibacterial, inorganic material, there's no possibility of mildew or mold. The system's modular construction has the advantage of allowing individual panels to be removed and changed, should they become damaged. The watering of the plants is carried out through a water reservoir, which can either be installed behind the wall or set into the floor, out of sight. Two pumps transport the water into a channel than runs along the top of the 'Grüne Wand®', from where it trickles into the substrate panels. 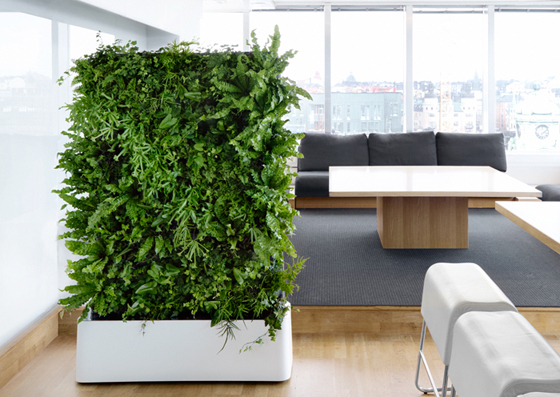 Apart from the decorative effect of a plant wall, this one has a room-purifying function: the humidity level goes up, which, particularly in the winter months, helps prevent colds. 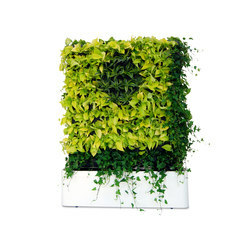 Moreover, plants draw pollutants out of the air, help eliminate dust, and produce oxygen. Last, but not least, plants, with their natural green, have a positive bearing on our psyche. 'Grüne Wand®' by Artaqua is available in two options: as a fixed installation and as a mobile unit. The latter is planted on both sides and is perfect as a sound-absorbing room-divider. 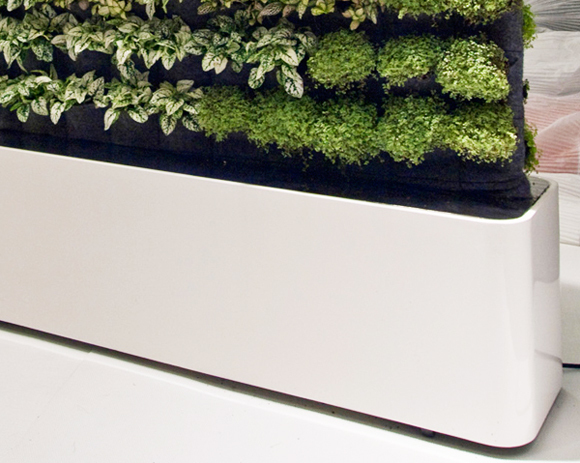 The Swedish company greenworks also offers a mobile room-divider. 'Moving Hedge' consists of a base, which houses a tank that can be filled with 55 litres of water and which can, due to its wheels, be pushed easily around the room. A snap-together metal pipe serves simultaneously as water supply and static framework for a four-ply industrial-felt panel, in whose pockets the plants are placed. Industrial felt has the advantage of not storing water: all the moisture goes directly into the soil held in the pockets. Like all plant walls, 'Moving Hedge' benefits the climate of a space, its air, its acoustics, and well-being in general. What's more, greenworks offers, with partner companies, a combination of the option to hire and planting subscriptions. Even without maintenance, 'Moving Hedge' is very easy to keep: the tank requires filling up just once every five weeks. In contrast to artaqua's 'Green Wall' and greenwork's 'Moving Hedge', 'Verticalis' is more of an object than an architectural element. The product was developed by the ZHAW (Zurich University of Applied Sciences) together with the company Hydroplant. As a 'plant canvas', 'Verticalis' can be hung on any large wall: just two screws are all that's needed. The dimensions of the acrylic frame, which is available in white, black or orange, measure 120cm by 55cm by just 7cm deep. Bespoke frames are an option. The integrated water tank needs to be filled every three weeks. 'Verticalis' is pleasingly lo-tech. The 'plant picture' doesn't have a pump, water or electrical connections. You could also describe the trellis as lo-tech, a traditional device for achieving vertical planting. Crops such as vines and fruit trees have long been attached to south-facing exterior walls by means of lattices or a wire frameworks. Then as now, this produces a kind of symbiosis, which has really positive effects: on the one hand, the plants enjoy the heat that has been stored up in the wall, and on the other the vegetation provides the house with insulation. 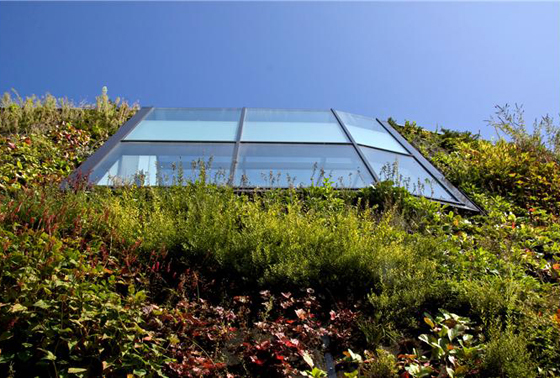 A layer of greenery on the facade of a house protects the structure and increases its lifespan. 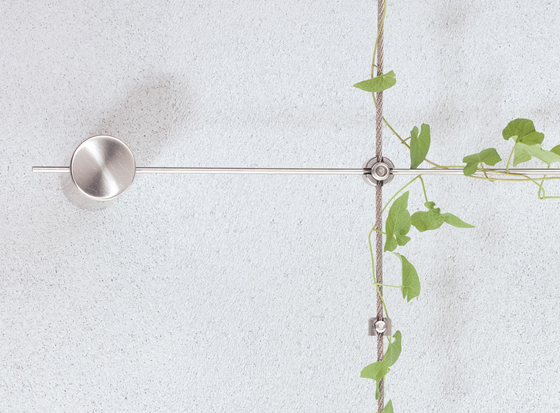 With its 'Decoline' series, Brugg Drahtseile offers a system of beautifully formed clips, connectors and metal wires, through which modern espaliers and exterior architectural planting can be achieved. Growing plants on vertical façades is a complicated process. 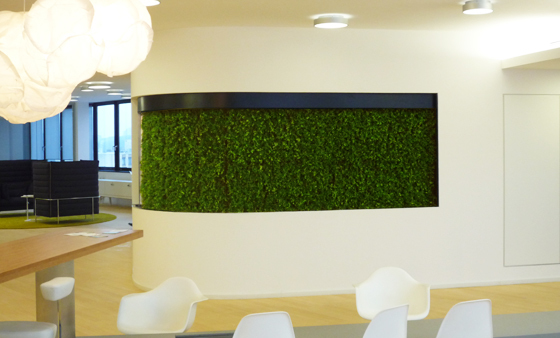 Copijn, specialists in designing and landscaping our green environment, developed the special ‘Wonderwall' system to do exactly this. The Wonderwall is an extra façade built in front of the building's waterproof layer. The framework of the false front is made of steel sections that have been underpinned at the bottom and attached to the building at the top. A planting wall made of metal, plastic and membrane is mounted to this supporting framework. The Hanging Gardens of Babylon, one of the Seven Wonders, can also grace your space, naturally in the appropriate form. No building of a viaduct necessary. Recently, carpentry-oriented joinery has been enjoying a renaissance thanks to the increased use of CNC-driven manufacturing techniques – even connecting parts can be produced in a number of geometric variations and cost efficiently at that.